Get Up to 100 FREE Books When You Book Bearj for Your Event! 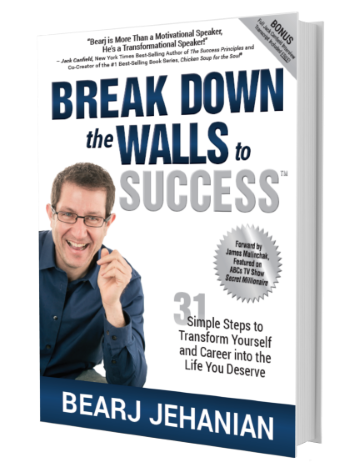 Book Bearj today and every member of your audience (up to 100 attendees) will receive a beautiful hard-cover copy of Bearj’s new book Break Down the Walls to Success – 31 Simple Steps to Transform Yourself and Your Career into the Life You Deserve. Additional books available at a discounted rate. You wish you could be more successful, but you are blocked by a wall that prevents you from taking the necessary steps to take yourself, your family and your career to the next level. That wall is built from fear, a poor self-image, bad past experiences or more. 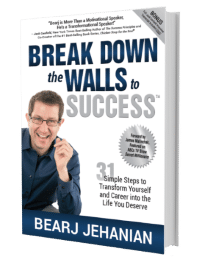 With humor, energy and wisdom, in his signature talk Bearj is the Corporate Speaker to arm you and your team with the tools needed to Break Down the Walls to Success. There is more pressure on students to succeed than ever before. A positive attitude, self-confidence and networking skills are a student’s greatest weapons in facing the paradigm shift when transitioning from full time student to the business world – especially in today’s difficult economy. Bearj’s passion for helping young people shines as he shares the success strategies that will give your college students the tools to succeed in college and into the business world. In today’s fast-paced world, students face more pressure to succeed and more pressure from their peers than ever before. Learning to balance how to fit in with how to be successful, while living in a social media fishbowl, is a challenge than many students have a major struggle with. Bearj’s 28 years as a teacher has made him an expert at connecting with students. His practical and simple approach gives student the tools they need to build a foundation for success they can implement right away! 31 Simple Steps to Transform Yourself and Your Career into the Life You Deserve! Success is an Attitude, Not a Destination. Being all in means you hold nothing back. You commit yourself 100% to a person, event, thing, business, employer, or cause. Most people get what it means to be all in and expect others to have an all-in commitment to them, but few ever commit themselves in that way. If you want to be successful, you’ve got to be all in. There’s no if, and, or but about it. This is a must. It’s is a non-negotiable point when it comes to success.